Elena Garcia-Velasco M.A.T. 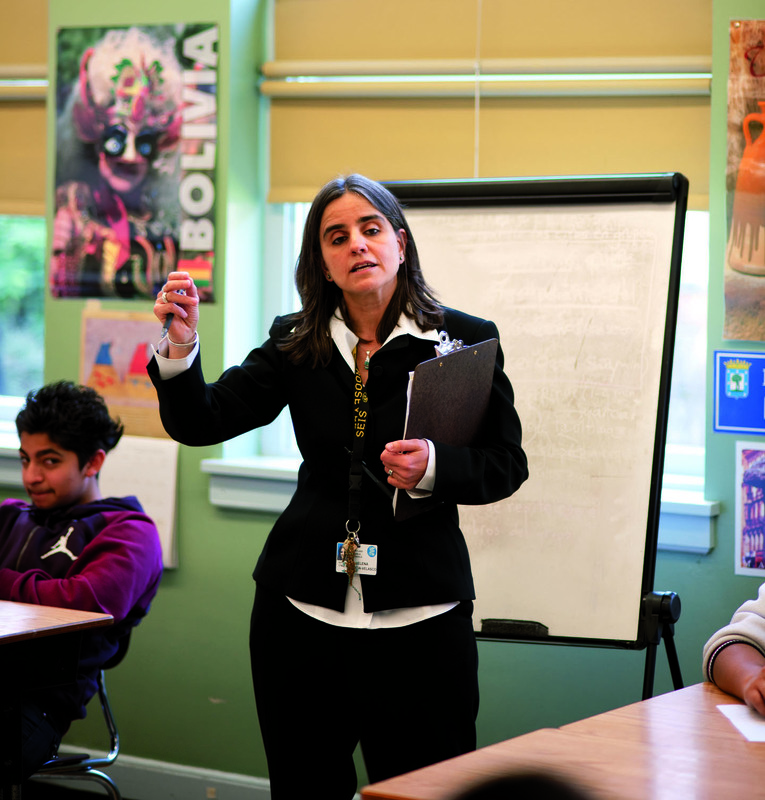 ’97, a transformative Spanish educator, is Oregon’s Teacher of the Year. The packed auditorium erupted in cheers and applause. That’s how Elena Garcia-Velasco M.A.T. ’97 began her acceptance speech after receiving Oregon’s 2011–12 Teacher of the Year Award last fall. The veteran Roosevelt High School language arts teacher had no idea she’d won the state’s highest teaching honor until her name was announced at a surprise assembly. At first, she appeared stunned and uncomfortable. She dislikes talking in front of large groups and she hadn’t prepared a speech. However, as she surveyed the audience, composed largely of low-income minority students with fledgling college ambitions, she knew this was an opportunity to build their confidence—something she’s known for. 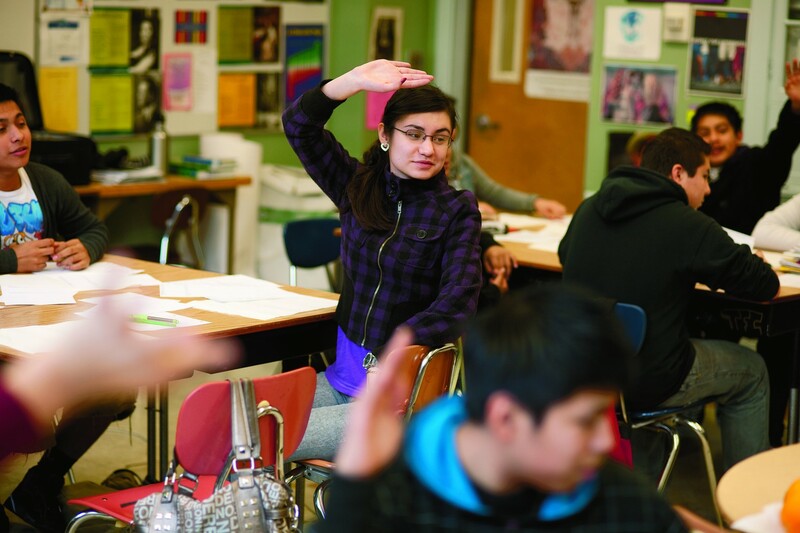 For Garcia-Velasco, students are her center, her compass, her North Star. Everything—her decisions, her curriculum, her schedule—emanates from them. If it’s good for her students, it makes sense. If it’s not good for her students, in Garcia-Velasco’s world, it doesn’t happen. Her student-focused approach to teaching works. An astounding number of her students, mostly Spanish-speaking Latinos and Chicanos who never dreamed of going to college, pursue degrees in higher education. Garcia-Velasco transforms students with poor literacy in their first language and little interest in higher education into serious, high-achieving learners who challenge cultural norms and graduate from college. Garcia-Velasco, who was born and raised in Spain, hails from a family in which everyone is expected to graduate from college. When she discovered that Latino students in America often don’t finish high school —let alone consider going to college— she knew she’d found her calling. When literacy is missing in students’ first language, it affects their literacy in other languages like English. Garcia-Velasco understands firsthand the obstacles her students face. When she came to the United States, she didn’t speak a word of English. She knows that immersion is the only way to become truly fluent and literate in another language. As a second-year teacher, she took a job at Roosevelt High School teaching Spanish as a second language and, over several years, built the Spanish language arts program from the ground up. 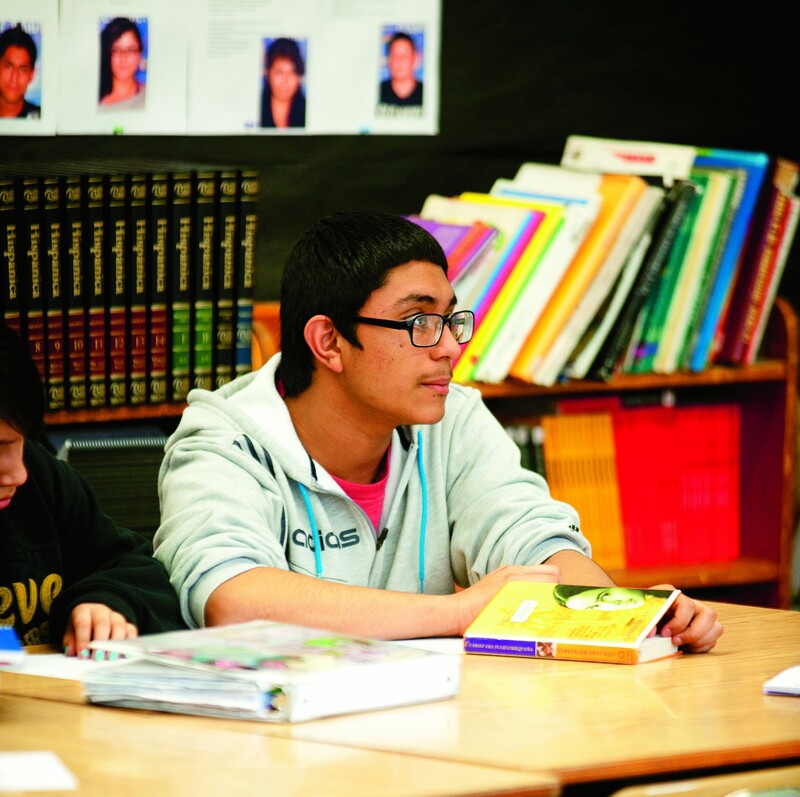 Fifteen years later, Garcia-Velasco teaches all four levels of Spanish, culminating in advanced placement classes, rigorous courses that require students to analyze classic Spanish poetry and literature. She’s the kind of teacher who has high expectations for her students—and it makes all the difference in their lives. “Students often send me cards and letters saying, ‘Thank you for believing in me, for pushing me, and for not giving up on me,’” she says softly. The students sit at small tables in groups of five or six. The room is large with a radiator that works overtime and big windows overlooking a courtyard. The walls are covered with slogans like “Respect our differences” and travel posters from Mexico, Guatemala, El Salvador, Honduras, Cuba, and Costa Rica—where many of the students or their ancestors come from. On one wall are the educational targets for the day’s lesson: think critically about the themes in a movie and formulate essential, deep questions related to the movie’s themes from articles you read. These are lofty goals, especially for students who aren’t used to being challenged by high expectations. Today, the students are discussing Real Women Have Curves, a film about a young Latino woman in East Los Angeles, torn between accepting a scholarship to a university and following her mother’s wishes to help support the family by working in a sewing factory. It’s a film that challenges gender stereotypes and raises difficult cultural questions. The questions her students come up with are difficult and thought provoking: Why do some parents not support their children going to college? Why is it easier for white people to go to college than Latinos? How does money affect people’s education? Why are jobs that require more physical effort valued less and paid least? What does it mean to be a “good” son or daughter? What is true beauty? Are you planning on going to college? Why or why not? Garcia-Velasco smiles frequently. This is a woman doing what she loves, and it shows. When she momentarily fumbles with the SmartBoard that was part of her Teacher of the Year prize, the students tease her and she laughs good-naturedly at herself. “I’m still learning,” she tells them. “Are you going to college?” one of the students asks his group. The question sets off a heated debate that even engages the previously taciturn girl. Her commitment is getting results. Nearly 100 percent of students in her AP Spanish Literature class go on to college. Her commitment is getting results. Nearly 100 percent of students in her AP Spanish Literature class go on to college. 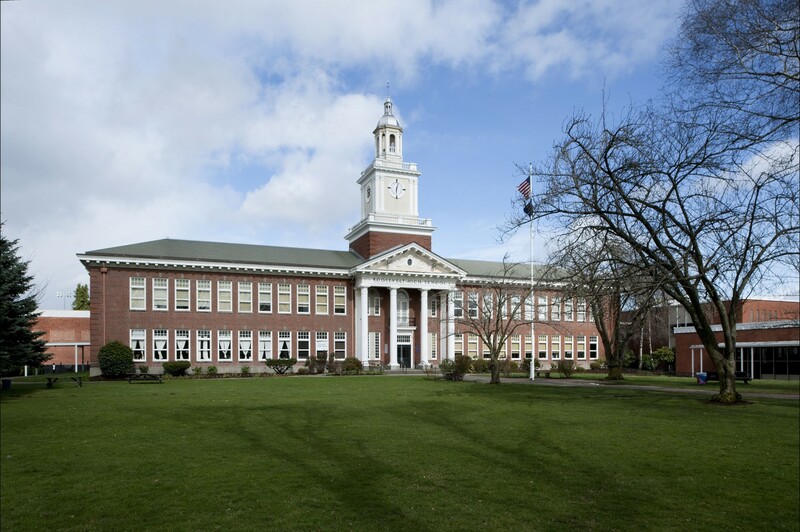 Of the 50 Oregon students statewide who took the AP Spanish Literature exam in May 2010, 12 of them were Garcia-Velasco’s students and 75 percent of them passed (the national average is 60 percent). Roosevelt High School students garnered $4 million in college scholarships last year. One of them was Angel Gutierrez, one of Garcia-Velasco’s students, who was awarded a full scholarship to Brown University. Freelance writer Bobbie Hasselbring is a frequent contributor to the Chronicle.